I decided to make a pull-out drawer for the ~7” gap between cabinets on my mobile workbench. I toyed with different uses and came up with clamp storage. This freed up two drawers for other uses. I need to find a decent way to make replaceable labels for the drawers. Great idea! 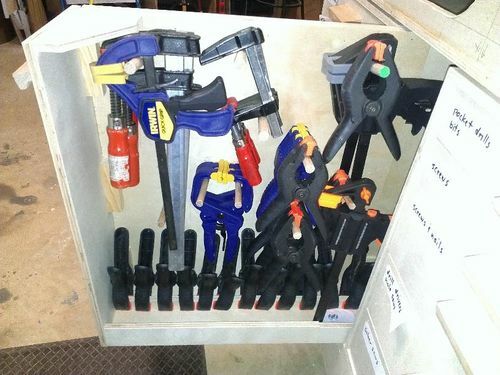 I need to incorporate something similar in my workbench so my clamps are close to my work and organized. Thanks for sharing! Nice design to save on some potential wasted space. I bought some of these for magazine holders I am making. They might work for your drawers. great use of a small space.very clever. Hi Garry ,that’s a good use of space How many clamps can fit in there? Great idea Garry, making use of small spaces…thanks for sharing. Gr8 way to use space. I finally got around to loading up the clamp drawer. I can get 30 to 35 clamps in there. How about glueing on Key Labels wehre You can Change the paper? Other idea is to add rare Earth Magnets by glueing them. into forstner holes. That Way You can put Stickers on Metall Signa and just Magnet it onto the fronts. You are ahead of me. Looks about how my workbench is supposed to Look. I just got. the Ron paulk style top finished. -- Whoever finds mistakes can keep them. English is a foreign language to me.